Oddly enough, for such a simple drink, it’s one that only the best bartenders we’ve met seem to have mastered. On the other hand, as “Mad Men” viewers will remember from one particular episode, Don Draper has, too. Dissolve superfine sugar — regular table sugar or cubes will also work but are harder to dissolve — in water or pour 1/2 ounce of simple syrup (i.e., sugar water) into an wide mouth Old Fashioned glass. If you like, muddle (smash) an orange slice in the bottom of the glass. Add ice cubes, whiskey and bitters — again, we personally prefer Angostura for bourbon or rye or Regan’s Orange for Canadian, but it’s your call. Stir vigorously with a swizzle stick or club spoon. If you like it a bit diluted, feel free to add just a bit of water, though purists will disagree wildly. 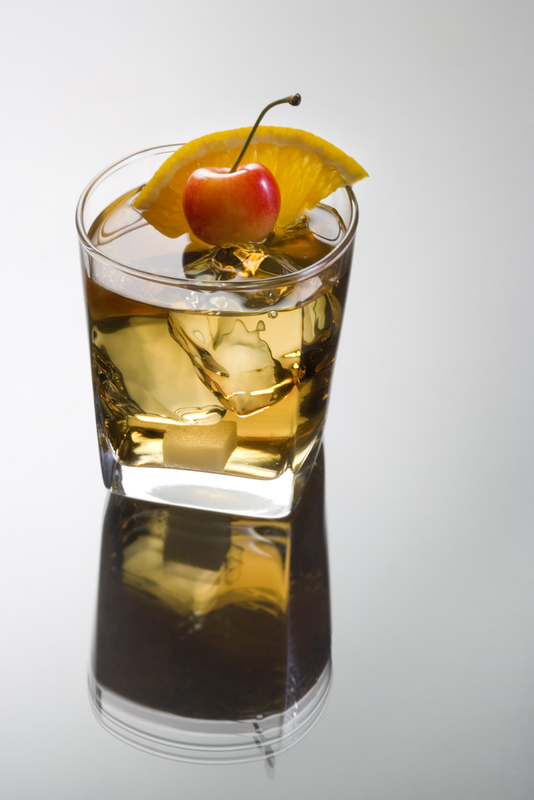 Now, as I alluded to above, there are a great many controversies about the Old Fashioned and what works best in one. Don Draper and I are quite partial to the muddled orange slice and/or marischino cherry, particularly if it’s one of the very expensive gourmet cherries you’ll find at some excellent high-end bars. Famed politics and cocktail maven Rachel Maddow finds all that sweetness to be of the sickly variety and offers only a slice of lemon zest in a move that’s similar to the traditional recipe for the sazerac, a drink we’ll be covering later. She also uses a sugar cube and a muddler rather than my preferred choice of using superfine sugar or simple syrup for an easier sugar distribution, as well as soda water. Esquire‘s resident cocktail historian, David Wondrich, is of a similar mind. I will say that I haven’t tried using soda water in the tiny quantities that Ms. Maddow does, nor have I tried one with as little ice, but I will be giving the Maddow/Wondrich historical version a shot soon enough. It might be a bit strong for most people, but since Wondrich and Maddow suggest two of my favorite products — Canadian Club and Rittenhouse Rye (100 proof — yes, sir!) — I’m optimistic that this originalist take might just work as well. On the the other hand, while I’ve been known to (gasp!) water my Old Fashioneds with just an additional splash or two, using a significant amount of soda water for this purpose is a big no-no, though it’s standard practice at many bars. Moreover, do not use maraschino “juice” in place of sugar/simple syrup, also standard practice at a lot of watering holes. To be scientific about it, it comes out way icky that way. I think me, Maddow, Wondrich, and even Draper would agree about that.